Gone are the simple days of running a small business; gone is the time when a disgruntled customer’s voice had a lifespan of a few days, and could travel only as far as their social circle allowed. We live in the future now, where reviews live forever. Where a few lil’ red stars can make or break your business. OwnerListens, a startup that spun out of a hummus shop in Palo Alto, is trying to give customers a more direct alternative to Yelp — and they’ve just raised over a million bucks to do it. Through OwnerListens, customers can send messages directly and anonymously to a business owner, who can then respond immediately via SMS. Feedback doesn’t have to be negative, of course — it can be positive, or even just a suggestion. The logic behind OwnerListens is pretty straight-forward: if you give customers a direct, pain-free line to the owner, they’ll (hopefully) try to get things fixed instead of storming straight to Yelp to punch out a 200-word tirade. And because it’s anonymous and private, customers will — at least theoretically — be honest and upfront. When he’d ask customers how things were, they’d smile to his face… only to go home and write nasty reviews, chipping away at his hard-earned ratings. 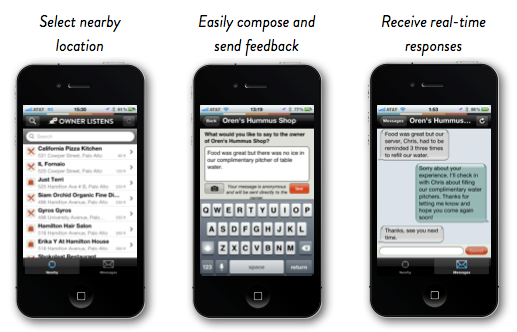 Within weeks of the restaurant’s opening, Oren had decided that OwnerListens was an app that needed to be built. He needed something that went straight to his phone, that allowed him to respond quickly, and that let customers share feedback anonymously. He convinced co-founders Adi Brittan, Michael Passey, and Niv Caner to hop on board, investing about $240k of his own money to get the ball rolling. Since then, around 1,200 businesses have hopped on board. They’ve pulled on everyone from lil’ Mom-n-Pop shops, to mid-sized chains like Philz Coffee, all the way up to big ol’ mammoths like Whole Foods Palo Alto. And if a business hasn’t registered with OwnerListens? They’ll still show up within the app, and customers can send messages their way. OwnerListens immediately sets out to hunt down the right inbox, something they say they’re able to do about 70% of the time. Of those they get in touch with, about 15% convert into users. This morning, we’ve got the exclusive word that OwnerListens has just closed a $1.1M Seed round from the likes of Menlo Ventures, Promus Ventures, Commerce Ventures, Subtraction Capital, Steve Blank, Jeff Epstein, Cary Rosenzweig, and Marc Abramowitz amongst others that have opted to go unnamed. If you’re paying particularly close attention and know waaaay too much about the world of VC, you might notice that their list of investors is… surprisingly varied, geographically. These aren’t just Valley firms — there’s folks from New York, Chicago, Philly, and a bunch of other major cities in there. OwnerListens says that was intentional; since they rely on local businesses, they figured it was better to have people championing them across the nation as opposed to just the Valley, so they’ve aimed to pull in investors from coast to coast. Of course, not everyone would want customers to have a direct line to the head honcho. Even at Oren’s own shop, he was met with some pretty hilarious opposition: one manager was caught trying to hide the signage they’d put out. That manager is … no longer with the company.